The Sand Motor, a large-scale peninsula comprising 21 million cubic metres of sand created on the coast at Kijkduin-Ter Heijde, has become a leading example worldwide of sustainable coastal protection. How is nature developing here, how are the dunes being replenished, and what is happening to the coastline? To answer these questions we need high-quality measuring equipment to continually monitor the coastline here. Thanks to financial support from Stichting Zabawas, the Sand Motor has now become a field laboratory for teaching and research in hydraulic engineering. On 25 September 2018 Delft University Fund gave the official starting signal for the C.J. Zanen Sand Motor educational programme and video observatory. With this programme, Stichting Zabawas is supporting the education of young engineers and the development of high-quality monitoring technology for the Dutch hydraulic engineering sector. 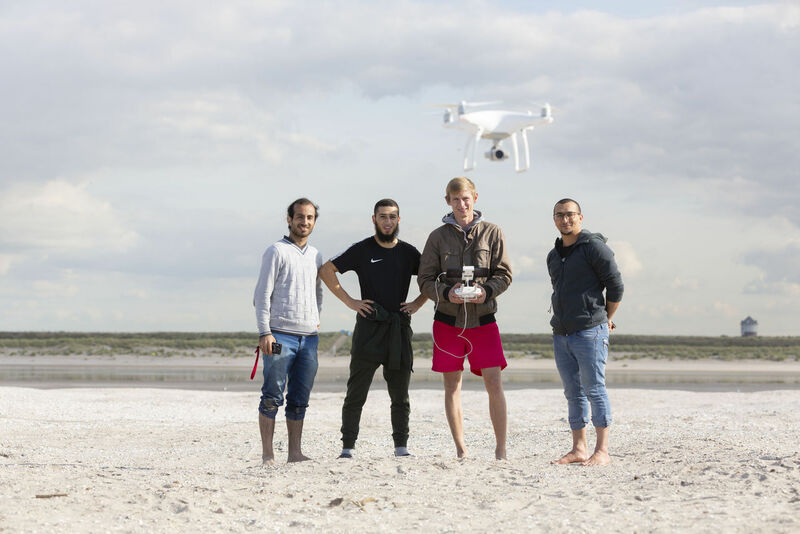 In Delft, Professor Stefan Aarninkhof (faculty of Civil Engineering and Geosciences), together with doctoral candidates, post-docs and other university partners, is closely examining the coastline from Hook of Holland to Scheveningen. The engineers of the future need skills to be able to carry out research into innovative methods of coastal protection. The C.J. Zanen educational programme comprises an annual week-long field trip in which students learn how to use field instruments and work under field conditions. In addition to this, cameras have been installed on the Sand Motor which make a recording of the coast, the sand surface, the vegetation in the dunes, and the waves, every thirty minutes. Setting up and using a coastal observatory plays a crucial role in the continuity of the Sand Motor as a field laboratory for teaching and research in the hydraulic engineering sector. "The project gives us the opportunity to build a bridge between pioneering research and a unique educational experience, right in our own backyard, at this wonderful location. The project can also help to establish an International Network of Coastline Observatories", says Prof. Aarninkhof. Hydraulic engineering is a field where high-quality theoretical knowledge goes hand in hand with practical experience and learning by doing. To this day the Dutch dredging sector forms the basis for a cast-iron competitive position worldwide. Strategic collaboration between the dredging industry and TU Delft acts as a catalyst for continuous innovation within the sector. Although the initial focus was purely on dredging technology, in recent years far more attention is being paid to the sustainable design of hydraulic engineering works. As a result of this, more sustainable methods of sand replenishment are being explored and in this respect the Sand Motor as a field laboratory plays an important role. There is much work to be done on providing protection against coastal flooding, not just in the Netherlands, but all around the world. TU Delft hopes to inspire future generations to choose a career in hydraulic engineering where they can ultimately contribute to combating coastal erosion using ‘natural’ methods.